Traveling for business can be challenging, but for those who need ADA accommodations, there is a whole secondary set of arrangements that have to be planned for. Selecting a corporate lodging provider that can address those needs help to make long term stay business trips stress-free. ADA accessibility is not mandatory in private dwellings, meaning apartments and houses, unlike a hotel. This makes choosing a hotel often the reflexive choice just because it is simpler. 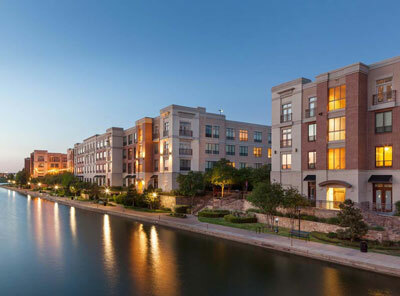 However, many corporate housing providers realize the need for ADA accessible apartments and are able to accommodate the request and provide first-class accommodations. Additionally, with the right corporate housing solution partner, the frustration of finding ADA accessible units is reduced. Corporate accommodations with ADA accessibility feature upscale, high-end furnishings, modern décor, full kitchens, all-inclusive utilities, Wi-Fi, flat screen televisions, on-staff housekeeping services, and more than enough space. The apartment building’s entrance will be easily accessible and feature a clear path to all entrances. This should include a threshold that can accommodate those in wheelchairs. All usable common and public areas must be fully accessible for those with disabilities. Entryways and hallways will need to have adequate space for those in a wheelchair to easily turn around and maneuver. All doorways inside the apartment should be wide enough to easily fit a wheelchair. This typically includes building out wider doorways for easier maneuvering. Flooring inside the unit should not hinder the tenant’s movement, so it will likely include hardwood flooring or ceramic tile. If carpeting is used, it should have a very low pile. Anything that the resident would need to control, like light switches, thermostats and electrical outlets must be arranged so that they are within reach of the tenant. The apartment’s walls must be reinforced so that they can accommodate grab bars where necessary. While bathrooms are the most common area where grab bars are needed, they may be required elsewhere for some residents and in some floorplans. Kitchens in ADA accessible units typically have lower countertops and cabinets so the tenant can prepare meals and clean up with ease. Some units may have spaces underneath the sink to easily accommodate a wheelchair. Appliances will also be well thought out. This may include a refrigerator with the freezer on the bottom and a stove with knobs and controls on the front rather than the top. Both of these considerations will allow the tenant to use the appliances safely and without risk of injury. Bathrooms will also have the necessary accommodations, including grab bars (attached to reinforced walls), and roll-in showers rather than a bathtub. Toilets in these units will be higher and will have grab bars as well. The sink will also be positioned so that it can easily be reached and may have space beneath it for a wheelchair. ADA accessible units are a necessity for many corporate travelers, and thankfully there is a way to easily find these units in any city. The best way is to work with a corporate housing provider that partners with properties that prioritize accessibility and comfort for their residents. Posted in Corporate Lodging AcommodationsTagged ADA Apartment, Corporate Lodging AccommodationsLeave a Comment on We Have ADA Accessible Corporate Apartments! As a project manager, you’ve likely got lots of balls in the air, so the last thing you want is a hassle with your lodging. You’re already in a different town, separated from your friends and family without the comforts of home, and you and your team should have a stress-free zone at the end of the day. Let Murphy’s corporate lodging take that off your to-do list and see to your needs for a change. 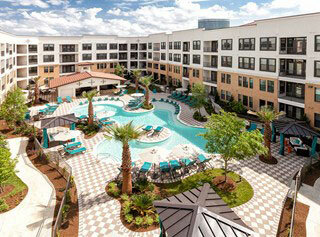 We’ve got the right property in the best neighborhood with all of the amenities you’re looking for to fit your budget. Our dedicated customer service professionals will handle all the little details so you and your people can get on with your work. What can you expect in your stress-free zone? More space—The typical corporate apartment is two to three times the size of the typical hotel room. The space is made up of separate rooms so if you can’t leave your stress outside your temporary home, you can at least shut it out of your bedroom for a peaceful night’s sleep. And won’t it be nice not to have to pack everything up and check out then settle back in again if you go home for the weekend? 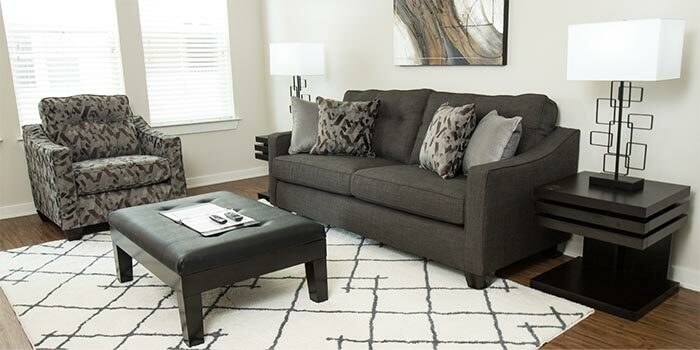 Comfort—We select our premium furnishings for your comfort. They are modern, attractive and carefully-maintained. If something breaks, we have backups ready, so we’ll replace it right away. High quality linens, a flat screen television, a cushy sofa and an inviting bed are all waiting for you in your home away from home. Amenities—Each apartment contains a fully-equipped kitchen, a dining table and chairs, comfortable living room and bedroom furniture, a washer and dryer and a modern bathroom. You’ll have plenty of space to entertain friends or colleagues in the relaxed atmosphere of your home, or to sit them down to work collaboratively after hours. Outside your apartment, most properties have a gym and pool for your use, and all of our properties offer free parking. Fully-equipped kitchen—Sampling the local fare is an integral part of getting to know a new city, if you’re on vacation. If you aren’t, eating out can become a chore, and it is always more expensive than eating in. Your apartment is fully stocked with all of the tools you need to cook whatever you want, whenever you want. Washer and dryer—While most people don’t like to do laundry, it’s even worse not to be able to. Each apartment has its own washer and dryer for the best in convenience. No need for expensive laundry services and no strangers handling your intimates. Technology—You’re wondering about WiFi, right? It’s the first question upon entering a new building these days, especially for busy professionals. We’ve got you covered. Free, secure WiFi is waiting for you and your guests in every Murphy’s apartment. Are you wondering about cable? Yes, we’ve got that, too, along with a modern flat screen TV ready for you to plug in your favorite device, so you can bring your own Netflix queue with you. We understand that you need these things for work and for play, so plug in and get on with it! And while you’re doing that, don’t forget to use our app for checking in and out. It will also show you the restaurant and entertainment options nearby. With Murphy’s, you’ll always have a modern, bright, comfortable apartment stocked with everything you need waiting for you and your team. We have over 50 years’ experience in making business travelers feel at home, so we can anticipate your needs. And we know that you’ll value two of our unique offerings. All-inclusive price—The price we quoted when you made your reservation is the price you’ll pay. Period. We won’t hold you captive with hidden fees or taxes, and we won’t try to up-sell you by withholding cable or WiFi, or adding fees for parking or gym use, let alone any other amenity. We will make you feel at home. 24/7 customer service—Whatever you need, whenever you need it; we’re here for you all day, every day. 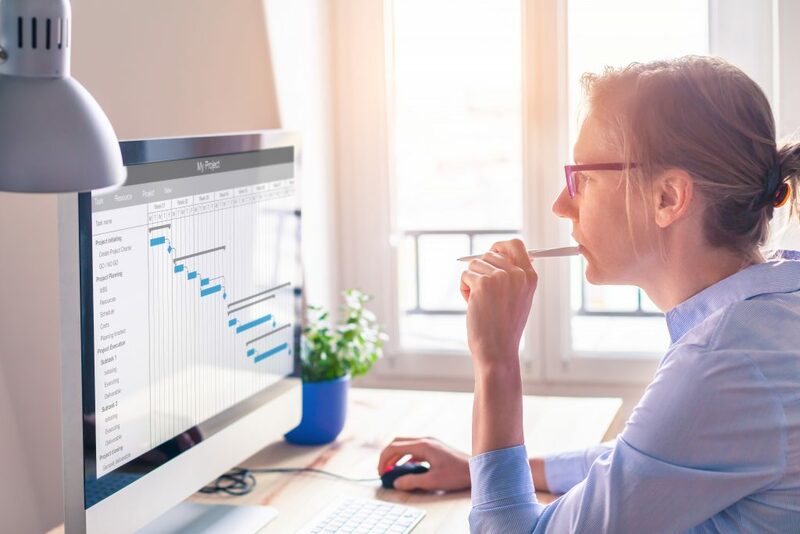 Project management is all about keeping everyone moving forward toward the goal while keeping track of all the details. We’ve got the resources and experience to free you up to concentrate on that work. We’ll take good care of you and your team, so rest easy and do what you need to do. Valuing people drives us. Service defines us. So you’ve visited a new city for business, and your hotel stay has been nice enough. The room was a bit cramped and you had to move your work off the bed before you could go to sleep, but you understand that space is at a premium in this town. You enjoyed the nearby restaurants for the first few nights, but you’ve grown tired of the same menus. It didn’t take long before you started to look forward to the end of the project just so you could go home and feel like yourself again. No matter how nice a hotel may be, it’ll never feel like home. The novelty soon wears off leaving you longing for your routine and some normalcy. When checkout day finally arrives, the bill is much more than expected. You’ve been quoted a rate, and you’d allocated your per diem accordingly. But you hadn’t given much thought to the $15 daily WiFi charge, the gym fee for the one day you had the time to work out, the $12 per day parking charge for the rental car, the outrageous 20% hospitality tax, the pay-per-view you watched, the hotel laundry and the expensive yet unimpressive breakfasts and room service meals. Corporate lodging offers so much more than a hotel ever could, and Murphy’s will provide it all for the price you were quoted. You’ll have your own apartment with a spacious floor plan, your own washer and dryer and the highest quality amenities designed to anticipate your every need. Your comfort is our goal, and we’re experts at reaching it. How do we do it? Free parking—You’ll always have adjacent, free parking with a Murphy’s apartment home. Fully-equipped kitchen—Full-sized appliances, premium cookware, a complete range of utensils, our own housewares—these are all waiting for you in your temporary home. Cook your own meals, heat up your take out, microwave some popcorn or store a selection of your morning yogurt in the fridge. Now you have options! 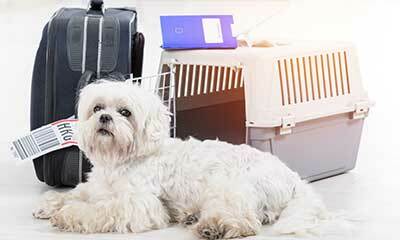 Pet-friendly homes—It’s so hard to leave him behind, isn’t it? He always knows when you’re taking off, and he turns those sad, eyes on you, silently begging. Well, pack the leash and his treats because he’s welcome in your temporary home! Bringing him along will lower your stress and make you both happier while you do what you need to do. You’ll find a lush green space for him to run around and do what he needs to do. And we aren’t dog-centric—we cordially invite your best friend, whoever that might be. Single point of contact for corporate accounts—Whatever your needs may be, a designated account coordinator is standing by to help. We can also help accommodate accounts in multiple cities, states and countries to make various projects seamless. Regular housekeeping—Our team of detail-oriented housekeepers will visit twice a week to keep your temporary home clean and fresh. If you would prefer more or less frequent attention, we’d be happy to arrange it. 24-hour support—Our customer service professionals are available to help you with whatever you need, 24/7. 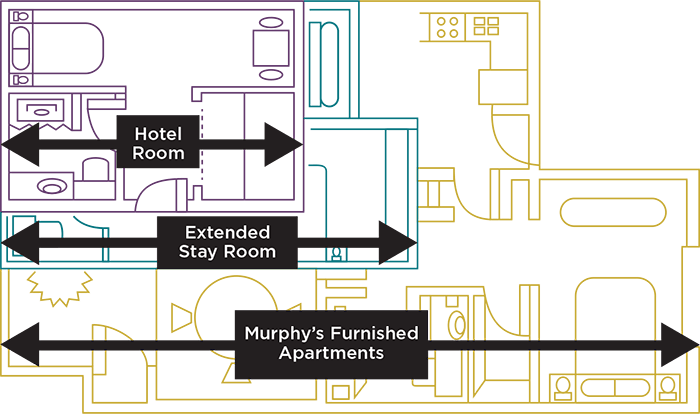 Large, flat-screen TV—Each Murphy’s apartment contains at least one large, flat-screen television. You’ll find modern ports where you can plug in the device that connects you to Netflix or that mirrors your screen for collaborating with colleagues. King sized bed—Stretch out after a long day and get comfy with our premium linens on a king-sized bed. There’s plenty of room for you to relax and get a great night’s sleep. One all-inclusive price—No hidden fees, no upcharges, no hospitality taxes, no parking charges, no surprises. The price you were quoted is the price you will pay. Period. A corporate apartment is the best approximation of home you’ll find on your travels. Murphy’s makes every effort to offer you a home away from home that is comfortable and inviting as well as efficient and workable. We’ve been doing this for over 50 years, so we’ve thought about what you’ll need before you need it. We’ve got your living space completely covered, freeing you up to concentrate on your work. Posted in Corporate Lodging AcommodationsLeave a Comment on Corporate Lodging Is So Much More Than A Hotel! 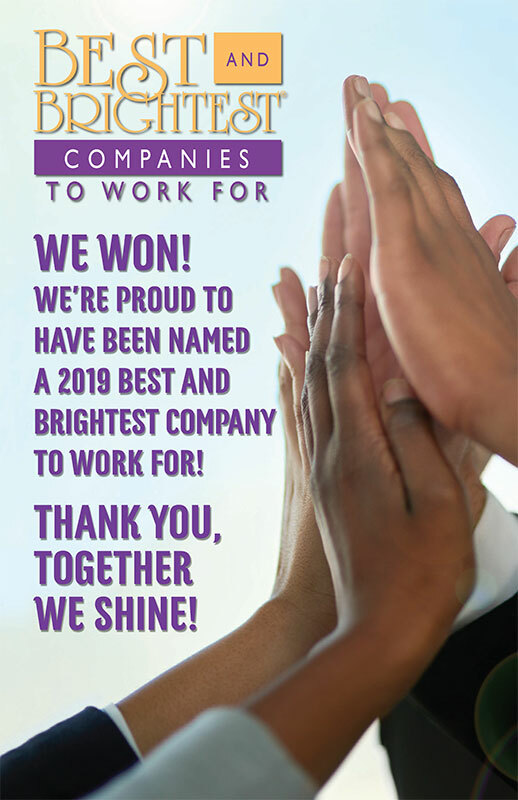 HOUSTON, TX – Within the first year of Jennifer Dillard becoming CEO, Houston Headquartered Murphy’s Corporate Lodging, Inc. has been included on the Best and Brightest Companies To Work For list. The honor is selectively awarded to regional companies that are considered exceptional in their human resource practices and commitment to employees. “This distinction is a testament to the corporate culture our team works hard to craft here,” said Jennifer Dillard, CEO. “At Murphy’s, our motto is ‘Valuing people drives us. Service defines us.’ We believe this to be more than just a motto, but a directive for how we interact with our clients and our staff,” Dillard continued. To be recognized on this list is a product of the outstanding individuals at Murphy’s who work hard to ensure a great corporate family experience for each other. As a company, we have long believed that when people feel valued and appreciated, the ability to provide top of the line customer service flows effortlessly from it,” Dillard added. Murphy’s Corporate Lodging, Inc.’s goal is to provide premium temporary corporate housing via fully furnished apartments to those searching for a home away from home. For that reason, it seems only fitting that when our employees arrive at work, it really feels like they are coming home again,” Dillard concluded. 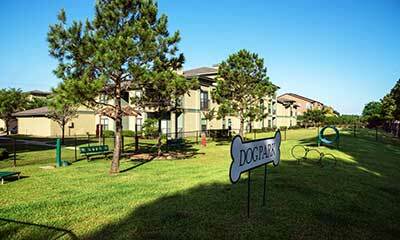 About Murphy’s Corporate Lodging, Inc. 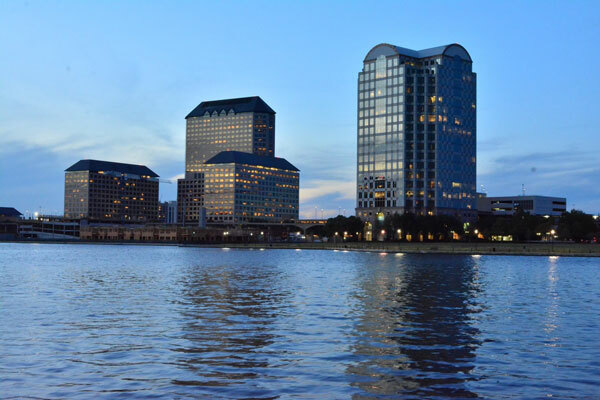 Established in 1972, Murphy’s Corporate Lodging, Inc. provides corporate housing in the form of premium fully furnished apartments with around the clock guest services in more than 100 cities nationwide. Services include flexible lease terms for short-term assignments, business trips, and relocations. For more information visit https://corplodge.com/.